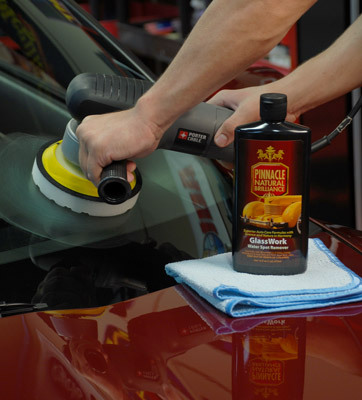 After using Pinnacle GlassWork Water Spot Remover, your glass will be perfectly clear. You will notice your wipers gliding over the slippery surface, quickly clearing rain, sleet, snow or road spray away from your windshield for safer driving. Always work on a cool surface in the shade. Glass should be washed and dried before use. Apply a quarter-sized amount of product directly onto a foam or microfiber applicator pad. Work on a 12” x 12” section of glass. Using firm pressure, apply Pinnacle GlassWork Water Spot Remover to glass using an overlapping, circular motion. Thoroughly work the polish in until it starts to turn clear. When it turns clear, it is ready to be wiped off. After working one section, immediately wipe off any excess residue using a clean, microfiber towel. Repeat with each section until the entire area is completed. 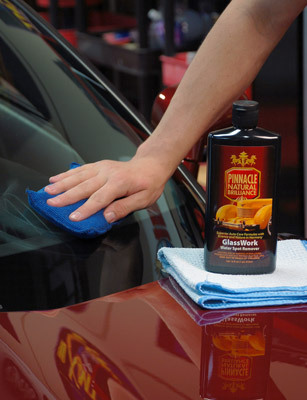 Pinnacle GlassWork Water Spot Remover can be applied with any type of machine polisher. Begin by taping-off and covering up any adjacent painted panels to avoid splatter. Apply about a quarter sized amount of product and work over a section of glass at a medium to high speed setting. We recommend using a Lake Country light-cutting or polishing foam pad. Use overlapping passes. Work product in until it starts to turn clear. If there are any remaining water spots, add more product and continue to polish. Wipe residue off immediately with microfiber towel and move to a new section of glass. Pinnacle GlassWork Water Spot Remover 128 oz. Love the Pinnacle GlassWork Water Spot Remover. Used my Porter-Cable to work in the lotion and the water spots came right off the glass. Super clean glass! I have had water spots on the rear window on a relatively new car (6 month old Mercedes 350GLE) that appeared to have etched in. They would not come off despite numerous attempts with multiple products. This worked perfectly, totally removing the ugly spots! This is a great product and very easy to use. 2005 Chevy truck and 2011 Mazda CX7 with severe spotting on the glass. I purchased this based on the reviews and I now have spotless glass! I used white pads and D/A buffer and followed up with Pinnacle Glass sealer and am simply amazed at the clarity of my windows now! Most definitely recommend! ConsThin consistency, but not really a problem. This stuff is pricey, but WOW does it work. Water spots were crying for mercy when I put this on my windows. I used a Porter Cable XP 7424 with 2 LC White pads, as the first pad turned black from the years of impacted filth on the windows. This stuff is worth a try if you want clean glass on your autos. ConsPrice, but you get what you pay for. I have used it on 3 trucks now and works really good at cleaning up the spots and small scratcs.